Camshaft holding/alignment tool – No.T40061. Camshaft sprocket holding tool – No.T40062. Crankshaft turning tool 1 – No.T40058. Crankshaft turning tool 2 – No.T40049. Primary timing chain tensioner locking tool – No.40071. NOTE: All bolts with an angular torque setting MUST be replaced. Turn crankshaft until just before TDC on No.1 cylinder. Slowly turn crankshaft pulley clockwise until locking pin can be inserted in crankshaft  . Tighten to 20 Nm. Ensure hole in RH camshaft sprocket at 7 o’clock position  . Ensure hole in LH camshaft sprocket at 5 o’clock position  . If not, remove crankshaft locking pin and turn crankshaft 1 turn. Install camshaft locking pin as shown  . Rotate camshaft locking pins to alignment position  . NOTE: The side pin of each camshaft locking pin must be in line with centre of camshaft sprocket. Ensure balancer shaft can be locked in position  . Fit primary timing chain tensioner locking tool  . Rotate LH camshaft until camshaft locking pin can be fitted  . Rotate camshaft locking pin to alignment position  . Repeat procedure for RH camshaft alignment. Hold LH camshaft with holding/alignment tool. Tighten LH camshaft sprocket bolts  . Tightening torque: 5 Nm. Remove LH camshaft locking pin  . Tighten LH camshaft sprocket bolts  . Tightening torque: 23 Nm. Remove crankshaft locking pin  . 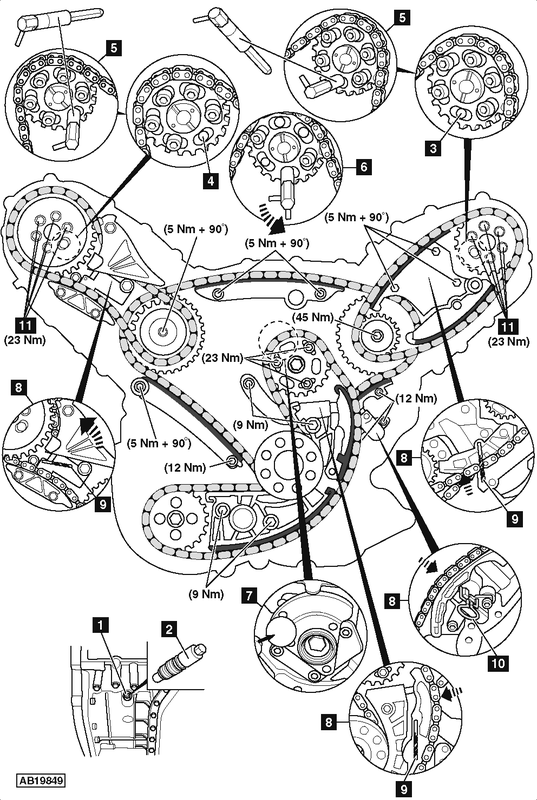 Release timing chain tensioner after repairs  &  . Turn crankshaft two turns clockwise until just before TDC on No.1 cylinder. Slowly turn crankshaft pulley clockwise until locking pin can be inserted in crankshaft  . Ensure camshaft locking pin can be inserted  .